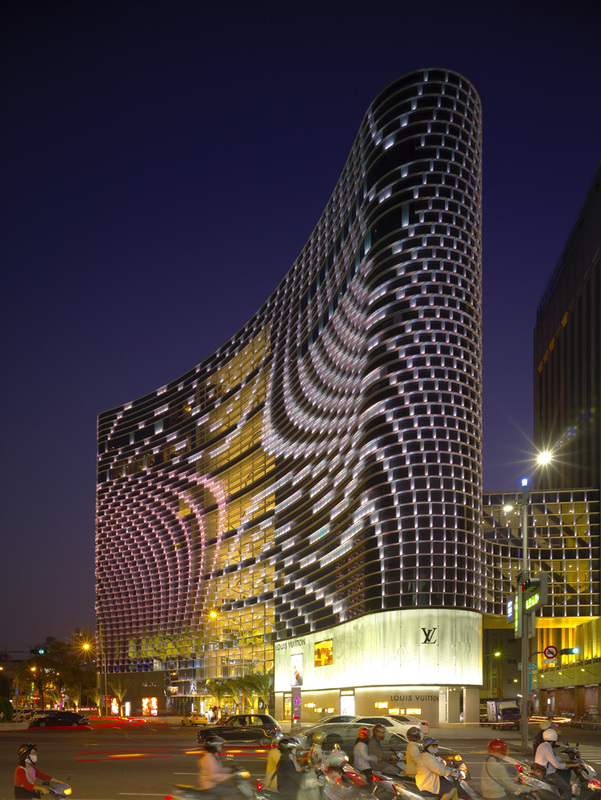 UN Studio has recently finished up the Star Place luxury shopping centre in Kaohsiung, Taiwan. FlickR user Hiroshiken has uploaded some photos and videos recently. The best video details the Lighting Installation at night. Before UNStudio was engaged on the project the architectural firm of Dynasty Design Corp and HCF Architects had already made a design for the location, of which the outlines and main structure were preserved. Consequently, the main structure and volume of the current building were predetermined. Within this framework UNStudio made some important alterations. Within the existing structure, the characteristic integration of program and construction that UNStudio strives for, resulting in the typical column-free spaces normally produced by the architects, was not possible. Therefore, in order to achieve the visual and spatial effects of free-flowing unobstructed spaces by other means, a public void was introduced that brings daylight to the floor spaces and establishes visual connections between the different floor levels. Positioned at an urban plaza with a roundabout, the building occupies a triangular lot, giving it a wide and open frontage. Curving inwardly, the building embraces this position and opens itself fully to the city. 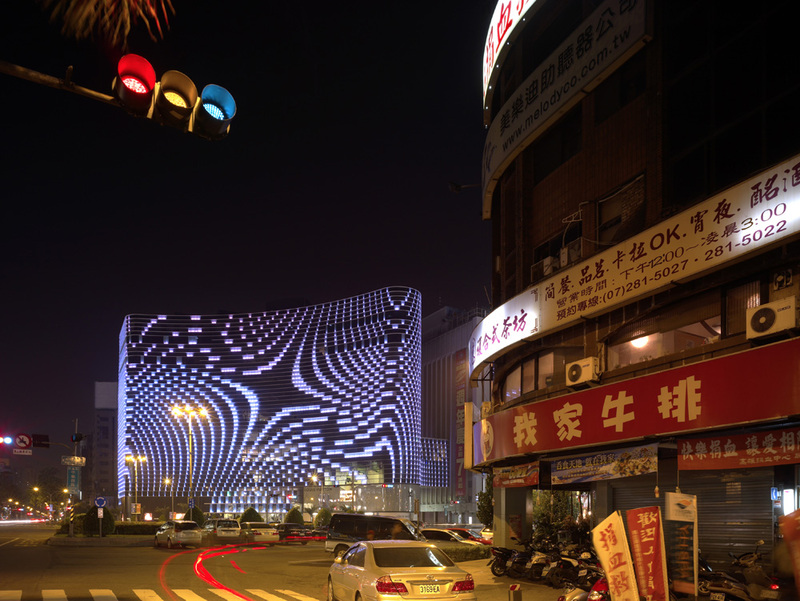 For UNStudio the question of the building began with the façade as an urban manifestation. However the chosen solution of a ‘deep’ front elevation, with a prominent pattern made by the application of protruding elements, was immediately reconnected to the internal arrangement of the spaces around the atrium, the circulation through the atrium and the views from the inside to the outside. As a result, the project now consists of a tight package of inside-outside relations. The 12-floor deep void is placed beside the façade, rather than deeper inside the building, in order to facilitate such inside-outside relations. 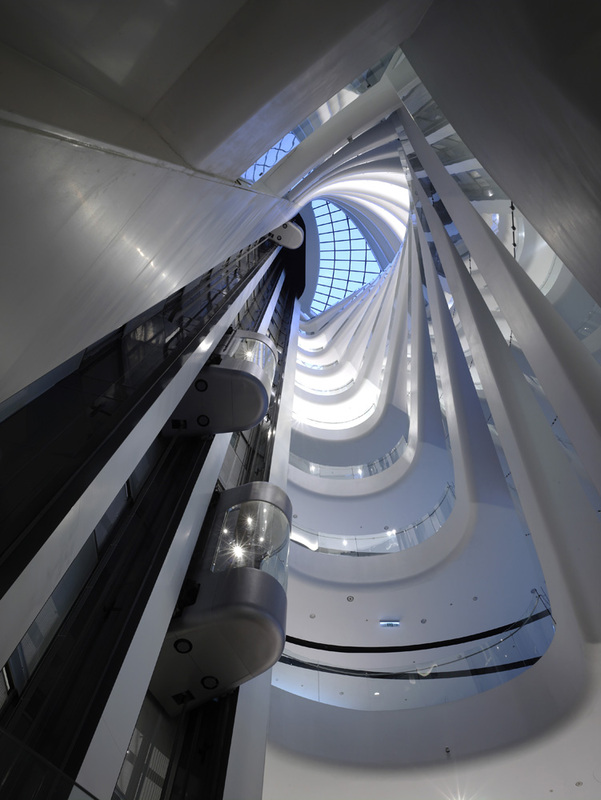 This void forms the main connecting element within the building, with three panorama elevators and two sets of escalators forming the vertical circulation. The void consists of a straight, circular opening which optically appears to slant and twist. 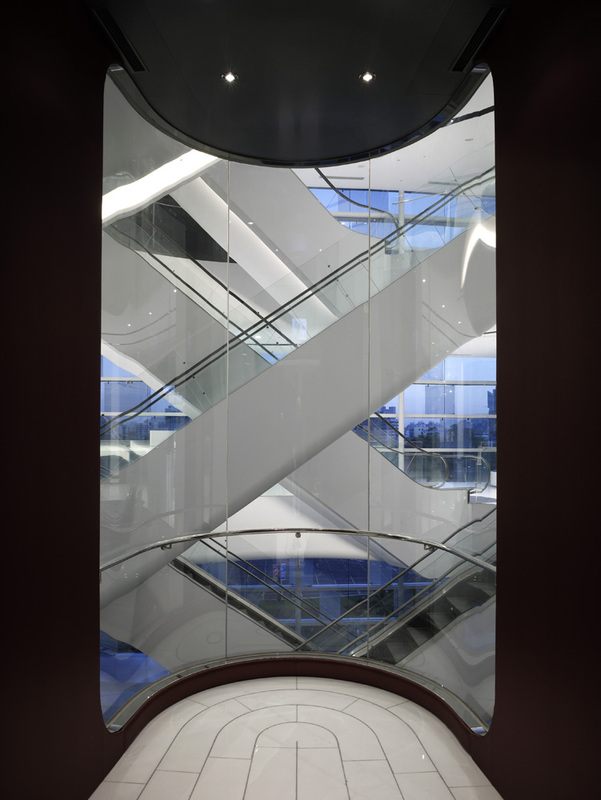 This optical effect is generated by the way in which escalators have been positioned inside the atrium space. 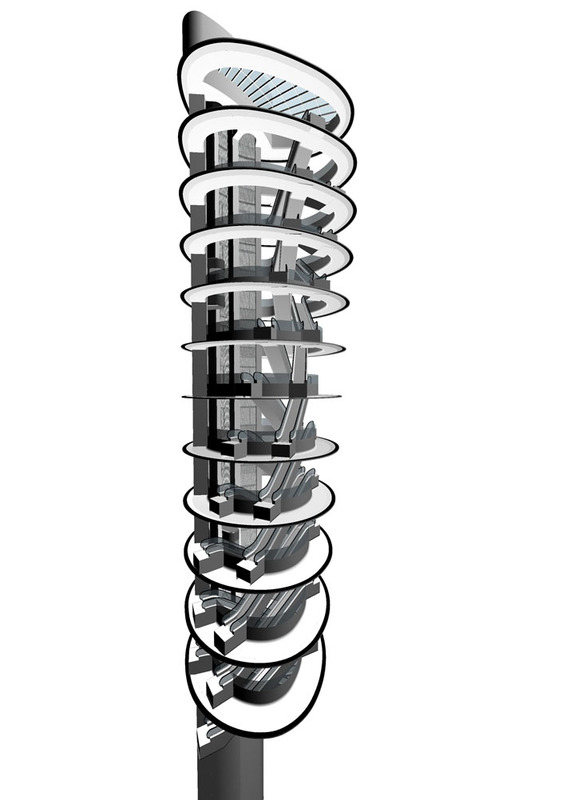 At each floor level the position of the escalators rotates by ten degrees, resulting in a 110 degree rotation from ground level to the roof. Surrounding the void, an open circulation space provides direct access to the shops, through doors in the glazed circulation walls. Each floor can house two to seven units, which operate completely independently. Thus, in contrast to a department store, the shop floors can be seen as individual stacked units, with the atrium functioning as a vertical shop window. The detailing of the circulation space emphasizes the relation of the inside and the outside; interior floor tiles, arranged in the same patterns which are also found on the sidewalk outside the shopping center, reflect the radiating pattern of the façade. The fire shutters, which are positioned around the central space, roll out horizontally from the columns, along rails which are integrated within recessed lighting rings in the ceiling. 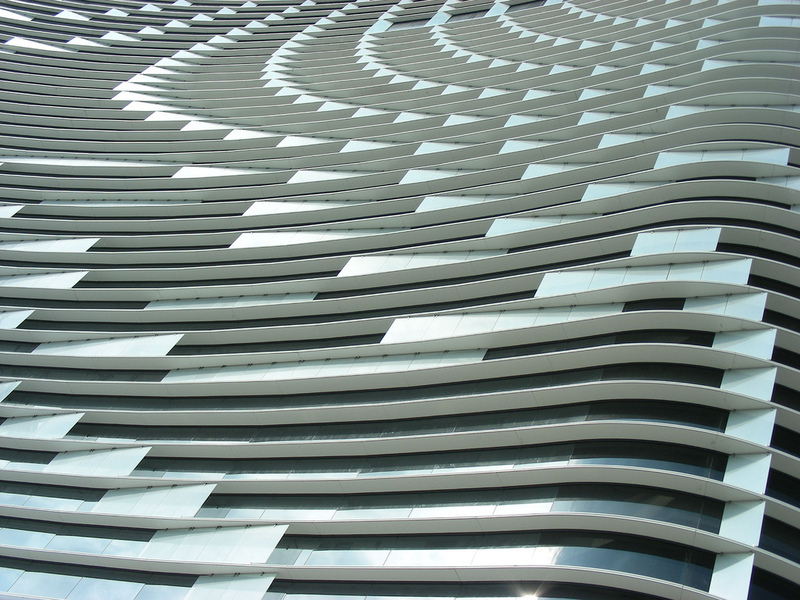 The open and transparent glass façade is patterned with projecting horizontal, aluminum-faced lamellas and vertical glass fins that together form a swirling pattern. This pattern breaks up the scale of the building, which, from the outside has no legible floor heights as a result of the one-meter spacing between the horizontal lamellas. Ostensibly, the pattern of lamellas and fins acts as a sunscreen and weather barrier, but in reality the combination of the wish to make a ‘deep’ façade while preserving the internal floor space was behind the choice to apply a pattern to the outside frontage. The pattern generates a strong urban effect, but has been modified on the basis of internal, functional demands. The vertical fins are for instance shallower and fewer towards the top of the building, where the restaurant is situated, allowing for higher transparency and better views towards the park opposite the building. The fins are made of laminated, low-iron glass for extra clarity. A ‘frit’ (dot pattern) has been printed on both sides of the glass, so that the fins appear white by day. Thus they seem to be made of the same material as the horizontal lamellas, resulting in the visual illusion of a unified façade pattern. But from the inside, the glass fins offer uninterrupted views to the outside, as the dots are not apparent from the inside, just like net curtains. The production of the fins, which all have different dimensions, was facilitated by parametric design and production techniques. The façade pattern wraps around the complete building, thus providing the closed rear facade with the same identity, but in a more simplified design. At night, colored lighting replaces the optical effects produced by the depth embedded in the façade motif, with a fluid layer of changing hues and tones. The dots on the laminated glass fins pick up the colors distributed by LED-lights which are integrated at the bases of the fins. The minimized light fittings contribute to the luxurious appearance of the façade. The night-time appearance of the building is important in Taiwan, which has a tradition of late-night shopping and all-night markets. The façade pattern was developed using animation software. A series of images was generated, which the client studied with the aid of a feng shui consultant. The final pattern was chosen because it represents a red phoenix.